IHBC’s ‘Heritage from the doorstep’: Lancashire’s strangest listed buildings – the ‘Pinfold’? 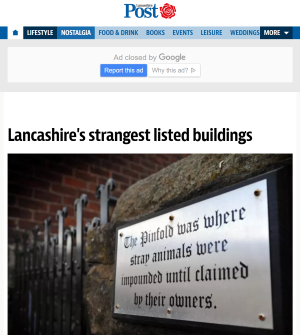 The Lancashire Post reports on how walled yards, or pinfolds – one just outside Broughton and the other in Great Eccleston – might well be the strangest listed buildings in Lancashire. Thousands drive past the Broughton pinfold every day on their commute to and from work and are completely unaware of its significance, or even what it is. Across Cumbria mainly, artist and sculptor Andy Goldsworthy has produced a number of egg-shaped scultpures, known as the ‘Goldsworthy Cone’ in numerous pinfolds. With there only being three remaining pinfolds across Lancashire today, following the large majority of them having fallen into disrepair or dismantled, effort has been made to preserve them in the interests of history, as they stand as monuments of the villages’ rural past.